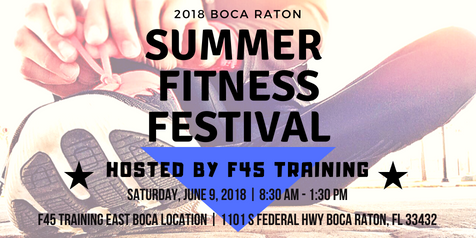 On Saturday, June 9, 2018, Downtown Boca Raton will hold its Summer Outdoor Fitness Festival from 8:30 am - 1:30 pm in the parking area of the new F45 Training location in East Boca Raton, FL. Hosted by F45 Training in cooperation with some of the area’s top health food markets, restaurants, fitness apparel & product retailers, and spas, this event will celebrate the grand opening of the new F45 Training location opening at 1101 S Federal Hwy, Boca Raton, FL 33432. F45 Training is a global fitness training community that specializes in fast & innovative, high-intensity group workouts designed to produce rapid results. In addition to F45 Training, some of the local businesses participating in this outdoor fitness event will include AeroJuice Smoothies, Go All Day Apparel, Celsius Sports Drinks, Fresh Kitchen, Europa Sports, and Rack’s Farmhouse Kitchen. The event is sure to awaken your mind & body and help get your heart rate going with a host of exciting fitness- and health-related events and activities. There will be free workouts and fitness evaluations, free food, drinks, and product samples, as well as drawings and competitive challenges with prizes awarded throughout the day. There will also be local sports teams and organizations competing in the renowned F45 Playoffs. This exciting outdoor fitness event is free and open to the public. For more information about F45 Training and the new East Boca location please visit www.f45training.com/bocaraton. We look forward to seeing you there!